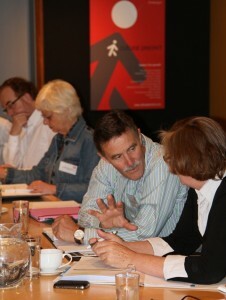 Jeremy Johnson (CEO, Sovereign Hill Museums) and Kate Clark (Director, Historic Houses Trust) at the CAMD Disaster Workshop and Annual General Meeting in Christchurch in November 2011. CAMD’s members manage 62 separate institutions which include state and national museums, social and natural history collections, science centres, heritage houses and outdoor museum sites. The collections they hold are broad, ranging from our earliest natural science specimens to cutting edge, modern design and technology. promote the social, educational, scientific, cultural and economic benefits of the wider museum sector to Government and the community. CAMD meets twice a year; on each occasion at a different member museum. It conducts an annual survey of member museums to assist in benchmarking and to gather a snapshot of the performance of major museums in the Australasian region. running a successful grants program for the International Year of Biodiversity. the Inquiry into the Role and Potential of the National Broadband Network (February 2011). CAMD is a non-Government, independent body. It is funded by its member museums which allows it to maintain a part-time member of staff.